Light is typically seen as a static entity that illuminates the space that we move through. Its intention is to aid our navigation around objects, highlight moments of importance and enhance the aesthetic quality of a place. From the point of view of a person however, landscape is made up from the bubble of space that we occupy. This bubble is constantly shifting and repurposing as we move through these larger contexts. We need light to respond to our shifting perspective, adjusting accordingly, as we mediate our surrounds. Our understanding of landscape is becoming increasingly blurred between real and virtual. We are living our lives on a digital plane, through social media and the digital comforts of modern life, alongside our physical existence. So the role of light and illumination begins to expand its function. Beyond navigation and aesthetics, it becomes a way to reveal information. This new ‘space’, as you will, is opening a niche for light to fill. It is something that yearns for the ability to adapt and move with its user. At the forefront of this new territory is the fashion industry – a practice that deals with the interface between the body and the landscape. Wearable devices and clothing are beginning to bridge our virtual world. Such as London based technology house, CuteCircuit, creating a twitter dress for singer Nicole Scherzinger in 2012. The dress was programmed to allow tweets from specific hashtags to flash across the dress. 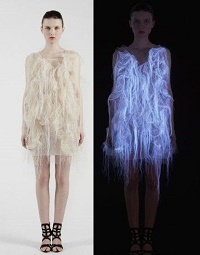 Chinese designer, Ying Gao, used sensory technology to fabricate a dress that moves, changes shape and lights up when looked at. The Montreal-based designer used eye tracking technology to activate the dress from someone’s gaze. With the growing technological development in the world of LED, many advances are contributing features to this end application of digital/physical interface. Such features that facilitate this growing tide of glowing fashion are their ability to use a relatively low amount of energy, the variable intensity of illumination and the endless colour palette. The future of glowing fabrics is looking bright. Earlier in the year a team of researchers developed a new light-emitting fibre that is able to be woven into fabric. This development means that the light itself can be flexible enough to be worn. The fibres use a stainless steel wire core, coated in a thin layer of Zn0 nanoparticles and encased in electroluminescent polymer. Then on top of this there is a transparent coating of carbon nanotubes, resulting in a millimetre thick fibre. They are currently in development to be woven into fabrics on a commercial scale. Fashion is fast becoming a multidisciplinary industry, reaching into science and applications of technology. Rethinking the space that we occupy and finding new ways to connect our ways of being is opening up a new tide, a new role for lighting. A responsive and dynamic state of illumination that not only changes how we read our surrounds, but feeds back into our context what we see.